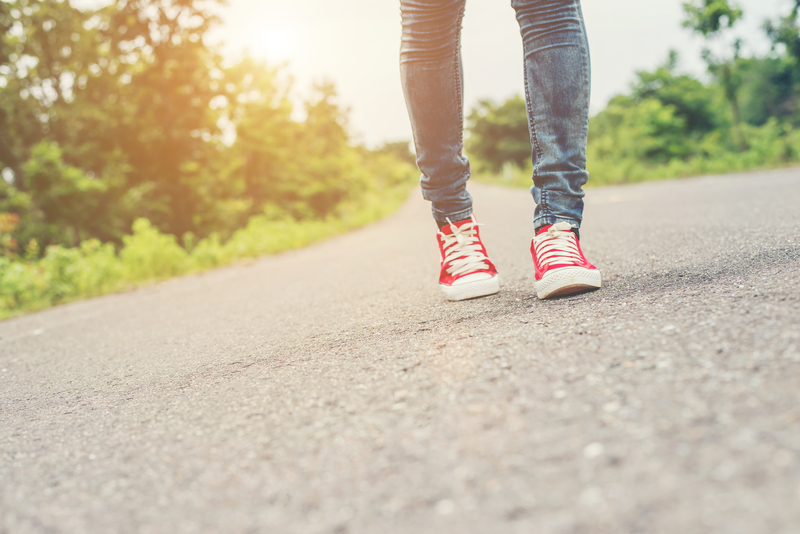 Standing, Walking and working all day on concrete floors can really have a negative long term effect on your body, if you don’t get the right footwear. The constant strain and impact can not only cause muscle fatigue and strain, it can also cause lower back pain that can last for years. Thankfully, with the right type of supportive shoe, you can avoid the pain associated with walking on hard concrete floors day in and day out and really focus on the job at hand. Whether you’re in construction, working on an assembly line at a factory, or involved in another field with constant impact on a concrete surface, it’s important to have the right footwear to avoid foot, back, leg and neck strains. So, what are the best shoes for walking and working on concrete? With so many types and beans available on the market, it can be difficult to choose the right one. Thankfully, we’ve done the work for you to choose the top four shoes for concrete. The shoes listed below will give you the comfort and support necessary to make it through the workday. If you are looking for the best shoes for walking on concrete, these shoes are some of the best on the market. From quality brands, the following boots have exactly what you need to stay comfortable during even the longest of work shifts. 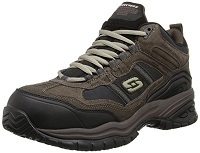 When it comes to great shoes for walking on concrete, Sketchers delivers. The Skechers for Work Men’s Soft Stride Canopy Slip Resistant Work Boot is a nice boot for anyone needing a slip-resistant and comfortable work boot. Not only do these boots feature key safety features like slip resistant 1.5” rubber heel and electric hazard proof, but there are also extremely comfortable during even the longest of working shifts. The Skechers for Work Men’s Soft Stride Canopy Slip Resistant Work Bootis made from imported leather and offer a relaxed fit. What’s even better is that they have a memory foam core. This design enables the boot to absorb impacts which means that your body isn’t. These lace-up boots are sporty casual and also offer a composite safety toe to keep your protected when working in hazardous environments. Plus, the scuff resistant leather with a Woven mesh side panels offers a unique cooling effect and better breathability than other shoes. With safety and comfort in mind, the Skechers for Work Men’s Soft Stride Canopy Slip Resistant Work Boot is tough to beat. If you are working on a concrete surface all day there are a few things you need in a shoe; comfort and safety. The Merrell Men’s Encore Gust Slip-On Shoe delivers both. The M-select GRIP sole is perfect for making sure that you stay upright even on slick surfaces. Aside from the mandatory safety component, these shoes also provide the comfort you need to keep your feet from aching after a long shift. The 2” heel boasts Merrell air cushion technology that absorbs impact to reduce aches and pains. The Merrell Men’s Encore Gust Slip-On Shoe also has a compression molded EVA foot frame that offers both comfort and stability. In addition, these work shoes come with an ortholitefootbed and a stick rubber outsole the reduces leg and foot fatigue. Plus, these shoes come with a breathable mesh lining that wicks moisture away and keeps your feet dry and comfortable. If you are looking for a comfortable and safe slip-on shoe with a sleek polished leather design, the Merrell Men’s Encore Gust Slip-On Shoes might be the best option for you. The Gel-foundation workplace walking shoe for men is one of the best footwears from ASICS’ line of performance-driven athletic shoes, consisting of a synthetic leather upper and slip-resistant rubber outsoles. The shoe is specially built for tough unyielding hard surfaces like concrete floors, and it is famous for its gel foundation which is intended to give an outstanding comfort to the foot. This workplace shoe is designed to mold itself to the wearer’s foot for a perfect fit, and it comes with a 2-layer memory foam to ensure comfort around the collar and heel region. It also features a lace-up closure system at the upper that can be loosened or tightened to the best comfort of your foot, while its shoe liners help you maintain a dry foot throughout the day. The midsole of this walking shoe is dual-density and it comes with spEVA, while its leather upper features a DuoMax support system all for a good balance and a proper arch support. ASICS Men’s workplace shoe is available in a variety of colors including brown and black, all of which look stylish, feel very comfortable, and are quite easy to clean. If you are a coach or supervisor who happens to walk for long hours every day on hard surfaces like concrete floors, ASICS Gel-foundation walking shoe is all you need to get the right support your foot needs. For those looking for a great pair of slip-resistant shoes, the New Balance Men’s MID626v2 Work Training Shoe is a great option. These shoes have maximum cushioning to keep your feet comfortable and come with the features needed to keep you from slipping while at work. They’re tested for ASTM F 2913-11, meaning they exceed in wet and dry conditions and the leather is breathable and comfortable. In addition to safety, the New Balance Men’s MID626v2 Work Training Shoe is great when it comes to comfort. The EVA foam footbed combined with an internal shank gives you the cushioning you need. It also comes with a 10 MM drop rating and a non-marking outsole to ensure that you keep floors scuff free. If you are looking for a shoe that is comfortable and safe, the New Balance Men’s MID626v2 Work Training Shoe might be the perfect fit for you. The Rockport Men’s We are Rockin Chranson Walking Shoe is another option when it comes to shoes that are great for walking and working on concrete. These shoes come with a sleek suede and syntheticdesign in both black and brown. They also come with a rubber outsole that will keep you from slipping while on concrete or other sleek surfaces. These lace-up shoes aren’t just well designed, they’re also extremely comfortable, which is great for those long days and nights at work. The Rockport Men’s We are Rockin Chranson Walking Shoe also comes with a shock absorbing cushion that enables you to reduce the stress on your joints. They also feature a mesh lining that wicks away moisture to keep your feet clean and dry. For those wanting a shock absorbing and slip resistant pair of work shoes, the lace-upRockport Men’s We are Rockin Chranson Walking Shoeis a great option. If you are looking for great shoes and you work on concrete floors all day, the Skechers Men’s Segment the Search Slip-On Loafer might be the best shoe for you. These shoes are stylish and come with an imported leather upper. The shoe is a casual loafer with contrast stitching and an inset pull-on tab located at the tongue. In addition to looking stylish, these shoes are also extremely safe and comfortable. The Skechers Men’s Segment the Search Slip-On Loafer also comes with dual elastic goring for a comfortable fit and a gel-infused memory foam insole to reduce aches and pains associated with lower quality shoes. The slip-resistant sole is also something to love in this casual yet dressy work shoe. If you are looking for a comfortable and stylish work shoe that provides stability and support, the Skechers Men’s Segment the Search Slip-On Loafer is the right choice for you. Timberland is an extremely well-known brand when it comes to work boots and shoes and the Timberland PRO Men’s Powertrain Sport Alloy Toe EH Industrial and Construction Shoe are no exception to the sentiment. These shoes come with a ripstop nylon upper that features abrasion-resistant screen print to keep your feet safe. The dual-density poly outsoles are also oil and slip resistant, in addition to being heat resistant up to 248 degrees. The great thing about the Timberland PRO Men’s Powertrain Sport Alloy Toe EH Industrial and Construction Shoe is that it also features comfort beyond belief. These shoes have a mesh lining that limits odors and provides temperature regulation. In addition, the shoes also offer a fiberglass shank that gives structural support for those long days on your feet. At just 1.12 kilograms per shoe, the Timberland PRO Men’s Powertrain Sport Alloy Toe EH Industrial and Construction Shoe are a lightweight, safe, and comfortable option for factory and construction workers. Clarks is a brand name that consumers trust when it comes to footwear and the CLARKS Women’s Everlay Coda Flat certainly won’t steer you wrong. These shoes are made a polished leather with stylish ruching to add a unique design element. They are slip-on shoes, but also offer a hook and loop strap to provide a more comfortable and stable fit. When it comes to comfort and safety for workers on a concrete floor day in and day out, the CLARKS Women’s Everlay Coda Flat is a great option. These stylish shoes have a rubber slip-resistant sole to keep you upright. In addition to safety, these shoes also take comfort to another level. With a soft ortholitefootbed and cushioned outsole, you can take every stride in comfort. The soft fabric lining is also great for added comfort but also has the capability to wick away moisture to keep your feet dry. If you are looking for a comfortable and versatile shoe from the well-known brand name Clarks, the CLARKS Women’s Everlay Coda Flat might be a great choice for you! Last, but not least are the Dansko Women’s Professional Mule. These clogs feature a polished leather upper that is sleek and easy to clean with just a cloth and some light soap and water. They also have a reinforced toe box to keep your feet protected in factory settings. Plus, the rocker bottom offers another measure of comfort by providing more stability and offering better shock absorption. The Dansko Women’s Professional Mule also offer great arch support, which is essential for anyone that is on their feet day in and day out. They’re also great for those with slightly wider feet because of the roomy toe box. When it comes to comfort, their anatomically contoured PU midsole and padded instep collar provide a level above the rest. Plus, the wide heel strike design provides better stability, which is essential for those on their feet all day. This classic shoe from Dansko is well loved and if you are looking for a great slip-on shoe for working on concrete, the Dansko Women’s Professional Mule is a great option. KEEN’s Kaci Full-Grain leather Slip-on is a sturdy, city-styled casual loafer and comfort footwear for women, made in the USA. It is a stylish pair of waterproof shoes that looks great with casual wears and promises your foot a great deal of protection whenever you are outdoors. The shoe’s upper is constructed from top-quality oiled Nubuck-leather, accompanied by an elastic gore hidden panel, as well as a decorative strap which has a laser-cut floral pattern on it. The upper is also beautifully designed with a beauriful textile lining for a stylish look. The supple full-grain leather also features the Cleansport NXT which will inhibit the growth of bacteria and manage odor when the temperature of the foot increases. The footbed of this Slip-On takes a Metatomical design to enhance arch support and deliver a next-to-foot all-day comfort. It is composed of recycled foam materials which are excellent for delivering outstanding underfoot cushioning. The footbed is also removable and it can be replaced with orthotics. The midsoles are made of compression-molded EVA foam materials to soften your strides, and within the shoes are mesh linings to provide good breathability. The medial sides of KEEN women’s Kaci full-grain leather Slip-On shoes are cleverly gored for a perfect fit to the foot. The shoe has a heel height of 1.25 inches, and it features a rubber toe cap that readily protects your foot during your urban exploration. The outsoles, on the other hand, are made from non-marking synthetic rubber materials, which makes the slip-On clog shoe safe for treading smooth indoor surfaces like gymnasiums, dance floors or basketball courts. The non-marking outsoles make Kaci full-grain leather slip-on an excellent women’s walking shoe on most smooth and sensitive terrain, while its easy slip-on style and water-resistant upper lets you get ready in no time and in any weather. If you are looking for a durable and nice-looking pair of clog shoes that can complement most of your casual outfits without sacrificing comfort, KEEN women’s Kaci full-grain leather slip-on is definitely a good choice to consider. Patagonia’s Better Slip-On is a closed-toe casual clog shoe for women, made in the USA, with great versatility and style. Basically, it features a nice-looking Thatcher Brown leather that readily blends with casual outfits for a variety of occasions and durable outsoles that deliver good stability on rough surfaces. The upper of this Slip-On clog shoe is composed of smooth and pliable full-grain leather, with a split toe design for a stylish look, as well as an Inset Stretch goring on each of the sides for easy on or off. With its round, medium-sized toe box, and the cradled interior that ensures proper arch support, this Slip-On clog shoe will nicely accommodate the whole foot without giving any form of discomfort even after long hours. The footbed of Patagonia women’s better clog shoe is also designed to readily conform to the wearer’s foot on the first few wears to make a perfect fit in the shortest possible time. The padded collar and shock-absorbing insoles of this Slip-On shoe promise the best foot comfort, and its stitched sidewall construction will reinforce its durability. The shoe features non-slippery synthetic outsoles with a stylish demi-wedge heel which is at an approximate height of 2 inches, and a platform at approximately 0.75 inches. At this height, the shoe makes a good option for short people, and it can as well fit in for both Casual and Business Casual purposes. The outsoles are 20% recycled rubber with a fluent heel-to-toe transition, and it offers an amazing traction as well as a good grip when treading uneven surfaces like loose rocks or icy pavements. For additional stability, the outsole is extended to the medial and lateral sides of the heel. Patagonia Better Clog Slip-On shoe can be a good choice for women who work long hours as it is constructed with comfort in mind, and it has little or no break-in time. The Better Clog Shoe can also compensate for narrow foot or women who want a little more height. If you need a sturdy and stylish casual Slip-On clog shoe that can fit well and give a lasting comfort, you should buy this! When it comes to shoes specifically designed for women, the Brooks Women’s Addiction Walker Walking Shoes are a great option. The cushioned tongue shoe combined with a padded textile lining gives you plenty of comfort to last through even the longest of shifts. Plus, there is also a shock absorbing midsole to reduce the strain on your feet, legs, and back. The Brooks Women’s Addiction Walker Walking Shoes also come with a dual density post with medial arch support. In addition to comfort, the Brooks Women’s Addiction Walker Walking Shoes are also safe to wear. The Engineered MC Pod Configuration enables great balance and flexibility. These shoes also feature a slip-resistant outsole that minimizes accidents in the workplace. If you are looking for the comfort of a running shoe with a great design and added safety features, the Brooks Women’s Addiction Walker Walking Shoes are the perfect shoe for you. Sketchers Sure track relaxed fit is a shoe built specifically to enhance performance and reduce fatigue for female workers who spend most of their time on concrete floors and other hard surfaces. The black work-shoe is crafted from a very durable and smooth water-proof leather, and it is specifically designed with a stretchy top panel to make the slip-on easy to wear. The stitching accent around the upper, as well as the protective perforated overlays around the toe and heel area, gives the shoe a textural contrast of style. Its relaxed fit design also provides the best comfort to the foot, and its low ankle height ensures you have the best fit for maximum mobility. The outsoles of the shoe, which is rated ASTM-F167-96, is made with an incredibly soft nitrile rubber that is resistant to oil and chemical, and also electrical-hazard safe, so you have almost nothing to worry about in terms of stability or safety. The one-inch built-in heel, topped by a memory foam insole forms a cushioned footbed that provides your underfoot with the right support it needs to tackle the toughest tasks at work. From the soft fabric collar trim and shoe lining to the shock-absorbing FlexSole midsole, women’s Sure track relaxed fit slip resistant work shoe features everything you need to remain comfortable and agile throughout the day. If you are a female office worker who thread wet or oily concrete and hard surfaces regularly, sketchers Sure track relaxed fit work shoe is an ideal choice for you! Last, but not least, the Merrell Women’s Encore Q2 Slide Ltr Climbing Shoe is another great option for anyone looking for a safe, lace-free shoe. These slip-resistant shoes also take comfort to the next level. With a Q Form 2 midsole that provides enhanced alignment and superior comfort, the Merrell Women’s Encore Q2 Slide Ltr Climbing Shoe is hard to beat. The Merrell Women’s Encore Q2 Slide Ltr Climbing Shoe comes with an important leather design that is easy to clean. This makes it ideal for any work environments. In addition, the rubber sole keeps you safe because it is slip resistant. This minimizes workplace accidents and keeps you from harm. The EVA footbed, nylon arch shank, and air cushion comfort are just added features that make these shoes such a great choice. If you want an easy to clean shoe that gives you comfort, safety, and support, the Merrell Women’s Encore Q2 Slide Ltr Climbing Shoe is hard to beat.